This blog first appeared on Union Solidarity International at https://usilive.org/coal-miners-against-coal/. Freddy Lozano leads a union of coal miners who are against coal mining. Let me break that down for you. 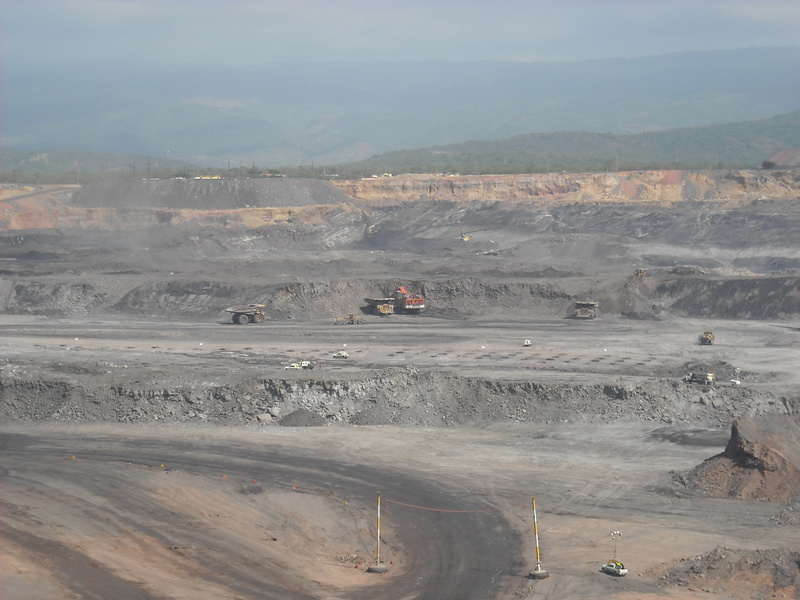 SINTRACARBON, headquartered in Riohacha, North Eastern Colombia, organises in one of the biggest open-cast coal mines on earth – Cerrejón. The name is taken from the indigenous Wayuu peoples’ name for the area meaning ‘Sacred Mountain’. Over the past 30 years that sacred mountain has become a vast network of pits run by Anglo-American, BHP Billiton and Glencore Xstrata. Seventeen indigenous and Afro-Colombian communities have been displaced and see the operation, in the words of Aurellio, a leader from the Campo Allegre community, as ‘terrorism against our people’. It was when Freddy, President of the Porto Bolivar Section, visited communities impacted by the mine eight years ago that he and the union embarked on a journey that would see them protest side by side with community members last year against the expansion of the mine. The company wanted to access 500 millions tons of coal under the Rio Rancheria river, the only major river in the dry province of La Guajira, by diverting it for 26.2 kilometres. Local communities reliant on the river were outraged. Jairo Quiroz of the executive of the union explains, ‘We were union members, students, environmental groups and indigenous people, all out demanding our rights and common needs. We could see that re-directing the Rio Rancheria would have a devastating impact on the communities which have already suffered so much. It was an unjust move on the part of the company and we stood on the side of the communities’. Due to the strength of popular resistance, the project has been shelved but Cerrejón has since shifted attention to re-routing 3 km of a smaller river, the Arroyo Bruno, which would still impact on water access for Indigenous communities. SINTRACARBON is working with environmental group CENSAT (The National Center of Health, Environment and Work) on a study of the effects of this plan. The union is aware of its members’ strategic power in the national and global energy industry. Colombia is the fourth biggest coal exporter in the world and Cerrejón alone exported 33 million tons of coal last year, most of it to Europe. But the union knows the game is changing: the price of coal has plummeted due to a global glut, mainly through increased US exports from $130 per ton in 2011 to $63 today. The union isn’t against coal per se and the leadership stresses that they don’t see many viable alternatives at present in Colombia but they know that worldwide there are struggles as well as scientific consensus saying that we need to leave most fossil fuels in the ground. “We are worried about climate change”, says Jairo Quiroz of the executive. “We can see this is a problem and many groups are working to try and stop coal. SINTRACARBON wants to be part of the discussion. The company is destructive, but if it goes the workers will be poorer than before”. As well as the big questions, such as the impact that carbon caps and climate change will have on their industry and ultimately their lives, the union is also having to deal with work related diseases and poor conditions. Last year they shut down the mine in a strike that lasted 32 days over the company’s failure to recognise and compensate 700 workers made sick by the mine. The union won wage increases, productivity bonuses and improved health and housing benefits. Casualisation is a major problem. Since 2009, half the workforce of 12,000 are now employed as third party contractors – numbering some 6,000 workers. Of those 2,800 have joined the union and 10 different agreements have been jointly negotiated to improve their conditions. But, as is the case in the UK, the company has chosen not to renew contracts with subcontractor outfits where union organisation has been high. Union-busting? It looks like it. “In 1984, the Thatcher government realised it was cheaper to import coal from Cerrejón. It relied on imports from Colombia and it was our coal that enabled the smashing of the NUM,” he says, shaking his head. Cultivating international solidarity and class consciousness among their cadre is key. Freddy explains, “We are trying to raise funds for an education programme for workers so they can gain a more sophisticated understanding of the working class and how it is formed. The mass media leads them to elect bad candidates and we need to challenge this”. We’re on common ground. Here too the shadow of far right parties winning elections looms large, casualisation continues to degrade, climate change is ignored and corporate contempt for the impact of extractive industries on communities – particularly in the case of fracking – continues. In Colombia, against all the odds, where union leaders are given armed guards and bulletproof vests (Freddy has one), and national union density is a death-squad driven 4%, SINTRACARBON is fighting for all and fighting it all. Can we learn from them? SINTRACARBON is seeking funds to help it develop worker education programmes. If branches would like to donate, please get in touch with contact@londonminingnetwork.org with SINTRACARBON SOLIDARITY in the header.